GRAND RAPIDS, Mich., March 13, 2017 – The Association for Corporate Growth (ACG) Western Michigan has named Comfort Research as its 2017 Outstanding Growth Award (OGA) winner. OGA honors a West Michigan company that demonstrates sustained growth in sales, profitability, employment and community involvement. Comfort Research will be honored during the annual OGA award ceremony on Tuesday, March 21 at DeVos Place. Comfort Research was founded in 1997 by Matt Jung and Chip George, two friends at Hope College who found themselves inspired to invent a more comfortable version of the old, worn out beanbag chairs they’d been using since they first moved to campus. They spent an afternoon shredding foam mattress pads and stuffing them in their old beanbags, and without even knowing it, their first product—The Fuf—was born. The duo began making more Fufs for their friend-to-friend network and that effort quickly resulted in 1,200 orders. In the 20 years since that time, Comfort Research has sold more than 10 million chairs in more than 75 styles while establishing itself as a top-selling brand at major national retailers including Pottery Barn, Walmart, and Target. To be considered for the award, a company must have an operational, financial or other business presence in West Michigan, $10 million minimum in annual sales, demonstrated growth in sales, profitability or employment, and continuing community involvement. Comfort Research was a finalist for the 2016 OGA, which was awarded to Open Systems Technologies. Other recent winners include JR Automation Technologies, LLC (2015), Founders Brewing Co. (2014), Zeeland Farm Services (2013), ADAC Automotive (2012), Service Express, Inc. (2011) and Perrigo (2010). Comfort Research is a product design and manufacturing company, based in the heart of West Michigan. The company creates seating products for both indoors and outdoors, and the unique pool/lake product market. Their comfortable products are filled with expanded polystyrene (EPS) beans, recycled shredded foam, or molded with its patented Orahh Technology, bringing their customers the most revolutionizing, affordable furniture. Virtually sold to every mass retailer with a significant presence on the web, Comfort Research’s promise to customers is big and FAT – FUNctional, Affordable and Trendy. To join the comfort revolution and to support ‘Comfort for All,’ visit www.comfortresearch.com. The Association for Corporate Growth (ACG) Western Michigan Chapter was founded in 1999 by a small group of M&A professionals who wanted to provide a forum for industry professionals to share knowledge and grow their professional and personal networks. 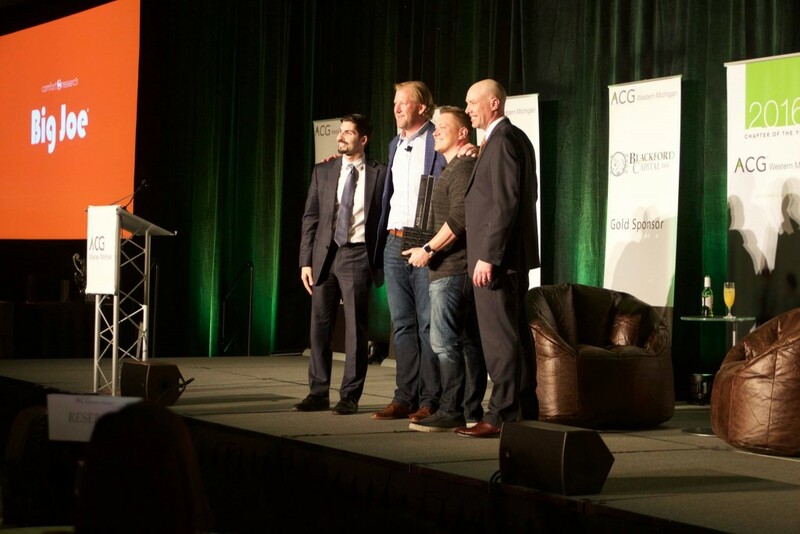 ACG meetings feature thought-provoking speakers with content relating directly to the concerns of high-growth and mid-size businesses. During 2016, more than 1100 unique attendees from more than 300 unique companies participated in ACG Western Michigan events including the ACG Cup competition, Women in Finance luncheons, Outstanding Growth Awards, Young Professional events, and other networking and educational programming. Learn more at www.acgwmich.org.